The agreement brings to a close what many say is the largest land condemnation case in the history of the state. Both Hennepin County and Land Partners II, the owners of the land before the county took it through eminent domain, spent well over $1 million in legal fees. They could have spent even more had the case gone to trial, which was scheduled for the first part of November. Even so, Hennepin County Commissioner Mike Opat didn't sound like a happy person. "We're relieved, but overjoyed? Certainly not. The public paid too much for this land," said Opat. The county set aside $23 million to pay for land. But that $23 million was supposed to include the money it would take to pay for other costs associated with the stadium. So when it looked like the county would need help, officials asked the Twins to kick in some extra money. Commissioner Opat revealed that Twins owner Carl Pohlad will contribute another $15 million, on top of the team's $130 million share of the costs. But he says the county will still have to forego building some amenities originally planned for the stadium. "I think the first things to go will be some streetscapes that we won't be able to build, at least not without some other participation from the city or elsewhere," said Opat. "We're not going to see some public art around it, I guess, that we would have hoped to build." In return for the $15 million, Pohlad will get development rights to a nearly three-acre parcel of land that's adjacent to the south side of the stadium. A team official says the site will be used for media and team parking. And they say no development plans are in the works. Many numbers have been thrown around during the land dispute. During the month-long condemnation hearings held this summer, the landowners presented an appraisal for their site of around $65 million. But two of the three members of the condemnation panel ruled that the land was worth closer to $24 million. The exact amount the county will pay has not been determined. The county has 30 days to cut the check, and when it does it will include interest which has been accruing since the county took the land earlier this year. Landowner spokesman Aron Kahn says there are more relevant numbers to pay attention to. "The commissioners wanted to pay $13 million. That was their original offer. Then they offered $19 million after my clients said they wanted $33 million," said Kahn. "Those are the relevant figures." Kahn is a former reporter for the St. Paul Pioneer Press who has covered stadium funding discussions at the Capitol. He has also done non-stadium related work for Minnesota Public Radio. Kahn maintains this dispute could have been avoided entirely had the county worked out a price with the owners before they went to the Legislature. "The landowners attempted to negotiate with the county, for months and months and months," said Kahn. "The county drafted the 2006 bill at the Legislature and lobbied it through the session, but never once asked the landowners what they wanted for the land." Perhaps the party happiest to see this chapter end is the Minnesota Twins. The organization has been quiet for the most part throughout the land dispute, although attorneys for the team have been present during nearly all the legal proceedings. After the deal was announced, Twins spokesman Kevin Smith sounded triumphant. "The land issue for our fans and for the people watching this is now gone, done, finalized," said Smith. "Now we can spend 110 percent of our engergies focused on building this iconic ballpark for the future." 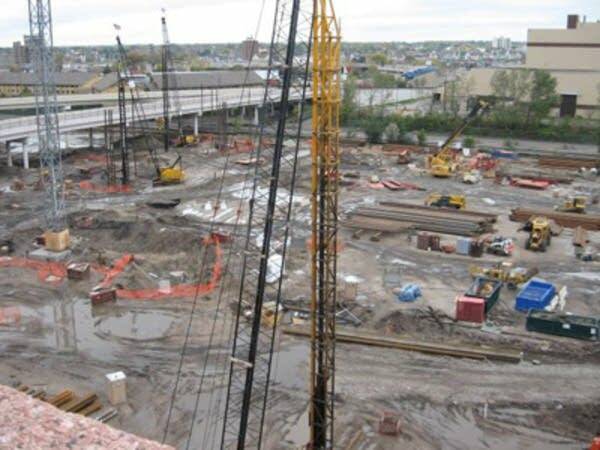 Smith added that despite some soil problems that have been exacerbated by recent rainy weather, stadium construction is still on schedule to be done in time for the 2010 season.